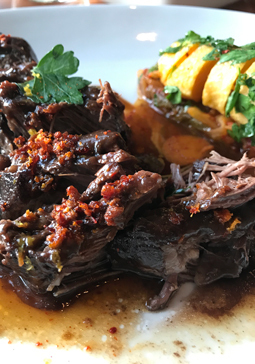 Akaushi Beef Short Ribs - A recipe from Savor California, the online showcase for extraordinary gourmet foods and beverages from California. Recipe courtesy of Chef Sean O'Toole, Torc Restaurant, Napa, CA. Heat the Salute Santé! grapeseed oil in a large pan or Dutch oven. Roast the short ribs whole on each side. Remove the short ribs and sauté the onion, peppers, and garlic until translucent; continue with the cocoa powder and D’arbol chilies. Add the red wine, ruby port, balsamic vinegar, soy sauce and water and bring to a boil. Cover pan with a lid or foil and cook at 350’F for 4 hours. When tender remove the bones and cool the meat in the refrigerator. Once the meat is chilled, cut into nice cubes. Pass the liquid through a fine strainer and reduce to a glaze. Place the short rib cubes and glaze in a sauté pan. Baste until hot and they are ready to serve.